1. Unbox your SXFI AIR and download the SXFI APP from the Google Play Store or App Store. 2. Register for an account using your email address. 3. Personalise your Super X-Fi audio profile. 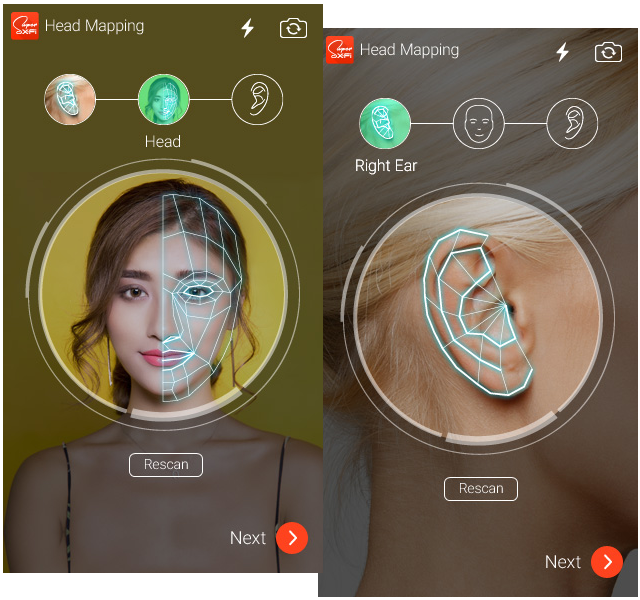 Follow the app’s instructions to perform Head Mapping by capturing images of your ears and face. For the best results, please hold the phone parallel to your outer ears. It's recommended that you find another person to assist you in capturing these images. 4. Select Wireless Setup on the SXFI APP. Creative SXFI AIR will appear on the devices list. 5. Hold the Bluetooth button on the AIR for 2 seconds. The SXFI APP will connect to the AIR and proceed to load your profile. Do note that this may take up to 3 minutes. 6. Press and hold the Bluetooth button on the AIR for 2 seconds to turn on pairing mode. Select Creative SXFI AIR on your mobile device's Bluetooth devices list. 7. You can now enjoy your favourite content on the go with the SXFI AIR!